An evening of Tabla Jugalbandi by Sarthak Kumar Mohanty, Pradhyumna Rao and Naman Sood, accompanied by Ustaad Ghulam Mogammed on Sarangi. 07.30 PM. Venue: Epicentre, Apparel House, Sector - 44, Gurgaon. Sarod recital by Amaan Ali Khan & Ayaan Ali Khan. Collab: IAFA. 07. 00 PM. Venue: India Habitat Centre, Lodhi Road, Delhi. Series Of Flute And Piano Recital By David Simon And Janos Palojtay. 07.00 PM. Venue: Kamani Auditorium, Copernicus Marg, Mandi House, Delhi. Trio- Sarth Khare (Violin), Prateek Saxena (Flute), Ramanan Venkataraman (Hansa Veena). Followed by Flute recital by Shubrodeep Paul; Jugal Bandhi- Pravar Tandon (Flute) & Shubham Modi (Vocal). Sitar recital by Debojyoti Mukherjee. Accompanists: Pranav Ramji, Pradeep Sircar & Pt.Samir Chatterjee (Tabla). Collab: Shubham Music Circle. 07.00 PM. Venue: India Habitat Centre, Lodhi Road, Delhi. Tabla solo recital by Riddhi Gulati, disciple of Shailendra Mishra. Hindustani Vocal recital by Mallika Banerjee, disciple of Parul Banerjee & Krishna Bisht. Sarod recital by Bruce Hamm, disciple of Ustad Ali Akbar Khan. Accompanist: Pt.Samir Chatterjee (Tabla). Collab: Chhandayan. 07.00 PM. Venue: India Habitat Centre, Lodhi Road, Delhi. Sitar recital by Amitava Chatterjee, disciple of Pt.Manilal Nag. Tabla recital by Somnath Ghosh, disciple of Pt.Anup Ghosh & Pt.Vinod Pathak. Hindustani Vocal recital by Parul Banerjee, disciple of Pt.Chinmay Lahiri & Vidushi Naina Devi. Collab: Chhandayan. 07.00 PM. Venue: India Habitat Centre, Lodhi Road, Delhi. Listen to this mesmerising Sitar Sarod duet/Jugalbandi by Maestros - LAKSHAY MOHAN GUPTA on Sitar, AAYUSH MOHAN GUPTA on Sarod, Accompanied by Pt Akhilesh Gundecha (Pakhawaj) & Shubh Maharaj (Tabla). 07.00 PM. Venue: Kamani Auditorium, Copernicus Marg, Mandi House, Delhi. Jugalbandi - Shehnai recital by Vikas Babu and Sitar recital by Alok Das Gupta. 07.00 PM. Venue: India Habitat Centre, Lodhi Road, Delhi. Sitar Recital by Pt. Shubhendra Rao, senior artist and disciple of Pt. Ravi Shankar. Accompanied by Shailendra Mishra on tabla Concert organised in memory of the late Amar Mishra. Venue Name: C.D. Deshmukh Auditorium. 06.30 PM. Venue: India International Centre, Lodhi Estate, Delhi. Tabla solo by Ustad Rashid Mustafa Thirakwa with Shariq Mustafa Followed by Hindustani Vocal recital by Shubha Mudgal Accompanist: Pt.Aneesh Pradhan (Tabla) Concludes with Santoor recital by Pt.Bhajan Sopori & Abhay Sopori. 07.00 PM. Venue: India Habitat Centre, Lodhi Road, Delhi. Tabla solo recital by Romaan Khan, disciple of Ustad Hashmat Ali Khan. Followed by Hindustani Vocal recital by Harpreet Singh Hasrat, disciple of Pt.Arvind Parikh. Concludes with Sitar recital by Roopa Panekar. Collab: Ustad Shafaat Ahmed Khan Music Memorial Society of Tabla. 07.00 PM. Venue: India Habitat Centre, Lodhi Road, Delhi. Gunijan Baithak Hindustani Classical Saxophone recital by Priyank Krishna, disciple of Pt.Ram Krishna. Collab: Kalpataru Arts. 07.00 PM. Venue: India Habitat Centre, Lodhi Road, delhi. An evening of solo Tabla recital by Vaibhav Borwankar, followed by Hindustani Classical Vocal recital by Pt. Gaurav Abhyankar, accompanied by Santosh Kanade on Harmonium. 07.30 PM. Venue: Epicentre, Apparel House, Sector 44, Gurgaon. Violin Recital by Darshan Singh Sur. Followed by Sitar recital by Dhruv Bedi Concluding with Symphony act by D Major Symphony Project. 07.00 PM. Venue: India Habitat Centre, Lodhi Road, Delhi. Western Classical Guitar Recital by Johannes Moller, Sweden Collab: ICCR. 07.00 PM. Venue: India Habitat Centre, Lodhi Road, Delhi. Swaranjali, Delhi & Srishti Dance of India, USA presents Chayanika (An evening of Indian classical Music and Dance) Featuring Solo sitar recital by Sh. Subrata De, Tabla accompaniment by Sh. Shailendra Mishra & Smt. Sreyashi Dey and the Srishti Dances ensemble,USA(in a new Odissi-Bharatanatyam collaborative choreographic work) Dancers - Sreyashi Dey, Ishika and Kritika Rajan in Odissi and Vertika Srivastava, Krithika and Akshaya Rajkumar in Bharatanatyam. 07.00 PM. Venue: Stein Auditorium, Habitat World, India Habitat Centre, Lodhi Road, Delhi. Dilip Kale is a performing instrumentalist and plays the santoor. He is a senior disciple of the legendary santoor maestro Shiv Kumar Sharma. He is trained in the harmonium and tabla in addition to Hindustani classical vocal music. 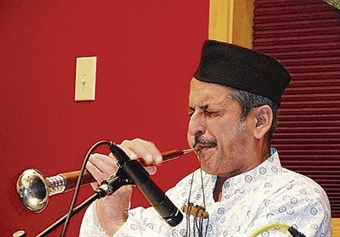 Ravindra Parchure of the Gwalior gharana has been trained by the late Manohar Bhagwat and has received guidance from the renowned vocalist Arun Kashalkar. A graded artiste of AIR, he is currently a Hindustani vocal music faculty at the Temple of Fine Arts, Singapore. 06.30 PM. Venue: NCPA Little Theatre, Nariman Point, Mumbai. Gharana Festival Dhrupad Recital by Pt.Harinath Jha Followed by Hindustani Vocal recital by Ustad Mujahid Hussain Khan. Collab: Swaranjali. 07.00 PM. Venue: India Habitat Centre, Lodhi Road, Delhi. Santoor Recital by Dr. Bipul Kumar Ray followed by Hindustani Vocal recital by Pt.Harish Tiwari. Collab: Pravah Music Society. 07.00 PM. Venue: India Habitat Centre, Lodhi Road, Delhi. IHC Morning Ragas. Hindustani Vocal recital by Shubha Mudgal Accompanists: Aneesh Pradhan (Tabla) & Sudhir Nayak (Harmonium). 10.30 AM. Venue: India Habitat Centre, Lodhi Road, Delhi.